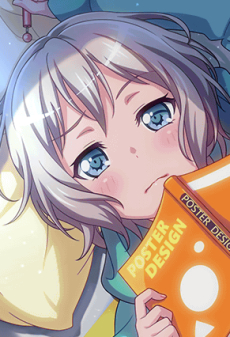 Moca doesn't really have anything that she's super into, and is apathetic towards things that don't interest her, but she's the type who will get really worked up about the people she finds important. She has a sleepy demeanor and speaks with a slow, monotone voice, but is surprisingly sly at times. She likes to keep doing one thing without quitting, and playing her guitar is one of those things. She is playful and often teases others to the point of having to be told by others to stop. She enjoys collecting point cards and sleeping. Also lives off bread.